Incredible depths. Areas unseen by most man. Of course we did hit one series of Caves in Kentucky called Mammoth, and they were not as interesting, since most of those caves are what are called Dry caves. The stalactite and then under them, the stalagmite. They come in many different types. Also in Kentucky we were in Diamond Cave, where they had some cut in half for us to see the insides. Very cool stuff. However, we know the Earth is about 6000 years old from the Bible. So did the Earth form with the stalactite and stalagmites already formed? God could have done that of course…. There is another answer too. The scientists that say they take so long are dead wrong. This photograph was taken February 1968 under the Lincoln Memorial in Washington DC. Stalactites grown over 5 feet long in 45 years. This photo was taken in 1953 for National Geographic. In this case, a stalagmite formed so quickly that it cemented a bat in it…. Do you think if it took tens to hundreds of thousands of years, the bat remains would have lasted that long? 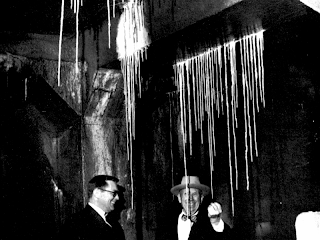 It turns out that stalactites and stalagmites can form very quickly under the right conditions…. Such as all of the water moving around quickly during the flood. Remember if you go to a cave, the guides quoting unrealistic numbers do so at their own risk.